words by Abby Watson Photos by Brian McCurdy. I’m generally not a believer in fate, and certainly don’t subscribe to sayings like “everything happens for a reason,” but sometimes a plan just comes together in a way that’s almost too good to be true. It was in this way that I found myself drinking beer at an alpine lake after being dropped off by a helicopter at 7,000’ with my MTB. 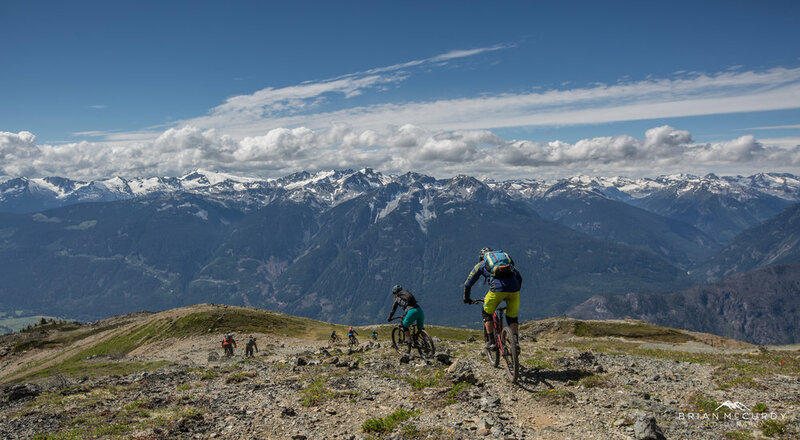 Whistler riding is hard, and it puts what we consider technical trails in Oregon to shame. In a perfect world, both Greg and I would have gone into this trip with more miles in our legs and a lot more confidence on trail. But as Cynthia would say, “you get what you get and you don’t get upset.” We were far from upset, and hoped our enthusiasm would help make up for our fitness. There are few people that I enjoy riding with as much as Cynthia. Not only does she make me laugh, but she is one remarkably competent woman with skills ranging from EMS training to MTB coach. Bottom line – I feel better going into any ride with her. Especially one in the backcountry on unfamiliar terrain. We had a group of ten riders, none of whom had done this ride before, all of whom were very excited to try something new. We did the usual pre-ride stuff where you stand around, take some photos, talk about bikes and look at maps. But this was not your usual ride, because a helicopter landed in a nearby field and we loaded up to head to the top of Mt Barbour, the 7,000’ peak which we would be riding off into what seemed like the unknown. The trail wasn’t super defined at the top, but there were enough turns burned in and scattered carines to be able to point us in the right direction as we headed in the direction of Tenequille Lake, the aforementioned alpine lake where cold beer and lunch awaited. We picked our way down, located the few key turns, and tried to make the most of this once in a lifetime experience. I didn’t ride fast, or all that smooth, but I did enjoy every moment and have so much fun. With this one adventure, I made up for a summer of not riding as much as I’d like. It was unexpected, and I didn’t take a single moment for granted. So, say yes to plans that seem a little out of the blue. You might stumble upon a bucket list ride. Big thanks to Cynthia and Brian Young for inviting us to tag along, to the rest of the crew for not being too hard on us Americans, and to Blackcomb Aviation for making this trip possible.